TNA Nutri Tabble; Launch of a new product! TNA Group is proud to announce our new products called: Nutri Tabble. Please take a look at our TNA Demonstration video on Youtube! Nutri Tabble are essential crop Micronutrients in effervescent tablet form. Specially designed for the ultimate convenience for the end user as well as several other benefits like perfect dosage, optimal yields as well as extra buffer agent to control pH. 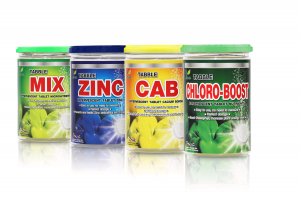 TNA Nutri Tabble at launch is available in 4 formulas: Tabble Mix, Tabble Chloro-Boost, Tabble Zinc, Tabble CaB. For more information or inquiries please contact us!